The circular economy concept is receiving increasing attention from academia and businesses as a conceivable means to decouple economic growth from material consumption. Product Service Systems (PSS), primarily due to their sustainability potential, have been identified as a promising lever that can facilitate the transition towards a circular economy. However, a product may not be more resource efficient or have reduced environmental impacts just because it is marketed through one of the various PSS business models. In this regard, the comprehensive End-of-Life (EOL) management of PSS can play a crucial role by maximizing the utilization of a product’s remaining value. 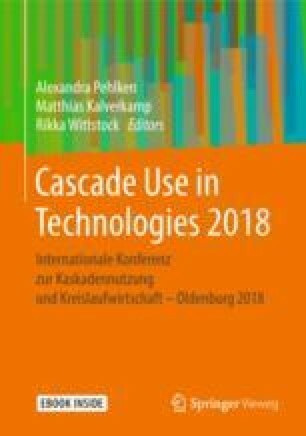 In this paper, we consider the applicability of the cascade use methodology proposed by Kalverkamp et al. in the context of PSS. Additionally, we explore the possible synergies and associated challenges between PSS business models and cascade utilization. The authors thank West Virginia University and the J. Wayne and Kathy Faculty Fellowship in Engineering for the support. Matthias Kalverkamp was financially supported by the German Federal Ministry of Education and Research (BMBF) in the Globaler Wandel Research Scheme (Grant No. 01LN1310A). Bezama, A. (2016). Let us discuss how cascading can help implement the circular economy and the bio-economy strategies. Waste Manag. Res. 34, 593e594. http://dx.doi.org/10.1177/0734242X16657973. Haberl, H., & Geissler, S. (2000). Cascade utilization of biomass: strategies for a more efficient use of a scarce resource. Ecological Engineering, 16, 111-121. https://doi.org/10.1016/s0925-8574(00)00059-8. European Commission, Closing the loop - An EU action plan for the Circular Economy. COM (2015) 614 final. [Online] Available: http://eur-lex.europa.eu/legal-content/EN/TXT/?uri=CELEX:52015DC0614. Accessed on: Jul. 05, 2016. ACtronics. Volvo—Magneti Marelli Gasklephuis. 2016. Available online: https://www.actronics.eu/volvo-magneti-marelli/ (accessed on 06 June 2018).